UPDATE: The Duke of Kent’s complete demolition was approved in August for a revised apartment tower design by the Planning Minister, after likely just missing out on protection via the Guildford Lane heritage study. 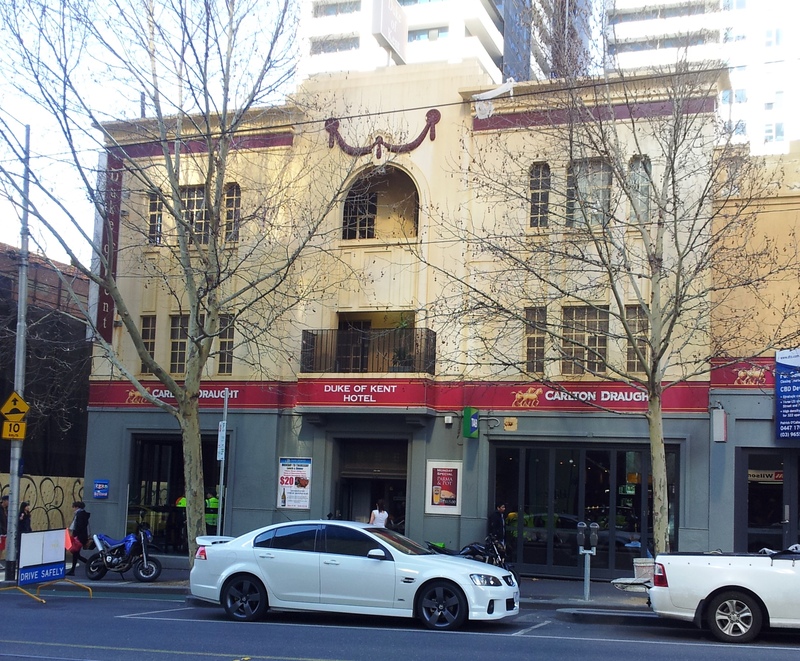 MHA recently received word of a new development proposal for the Duke of Kent site, and it seems the owners want to totally demolish the historic 1920’s pub on the edge of the Guildford Lane precinct for a car entry/pedestrian plaza under metal screening. The planning report claims the space will improve the pedestrian experience along Sutherland Street, but we think it looks like the very antithesis of the narrow and hidden historic character that makes the Guildford Lane precinct so unique. MHA objects to this proposal going ahead in this form. 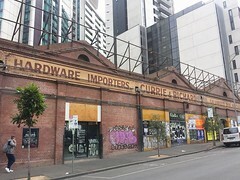 The demolition of the Duke of Kent Hotel taken in context with the historically significant Guildford Lane precinct is unacceptable in terms of the degrading of the heritage character and high heritage value associated with this unique area in the Melbourne CBD. The proposal must be viewed in the historical context of the declining number of traditional pubs in the CBD, once so such a common physical anchor on most city blocks, and a key feature of every day Melbourne life. The Duke of Kent also forms an important entry point into the remarkable Guildford Lane precinct. Permitting the demolition of an important piece of the historical fabric and entryway to this future heritage precinct is surely to be avoided as a matter of urgency. The Duke of Kent Hotel represents a rare interwar egyptian / neo-classical style of building, and has been in constant use as a hotel for over 150 years, receiving its license in 1864. It also has an important social history beyond it’s long use as a hotel and meeting place, with the location of the 1930’s New Theatre at the rear of the Hotel, still evidenced by a ‘New Theatre’ sign in Guildford lane itself. The New Theatre was a revolutionary avante-garde theatre group, notable for hosting a number of political debates and plays, and notable early public opposition to fascism in the decade leading up to the Second World War. 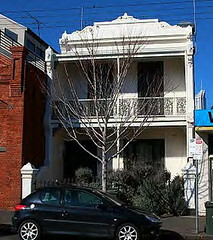 It also hosted the first Australian performance of renowned playwright Bertold Brecht, making the Duke of Kent an important place in the establishment and growth of modern Australian theatre and grassroots political culture. Aside from our obvious concerns with demolition of the historic fabric of the hotel, and consequent loss of social and heritage significance of the site, the proposal deeply compromises the key characteristics of the existing entryway into the Guildford Lane precinct. Opening up Sutherland Street by introducing ‘perforated’ screens and creating a plaza style experience for the pedestrian, whilst removing the zero setback side walls of the laneway entrance, will not only serve to degrade both the heritage fabric and pedestrian experience of the precinct, but also the very laneway qualities that, from a planning perspective, should be celebrated here. As a minimum, we believe that retaining the font portion of the hotel itself (to a depth of approximately 8m) would go some way towards providing a solution to the problems outlined. It would seem crucial to maintaining the essential historic character of both Sutherland Street and Flanigan Lane that the proposed development include contextual redbrick or a similar brick or masonry surface to its external street level walls as they abut these laneways. In particular, the rear Flanigan Lane presentation should be of a higher standard than blank pre-fab concrete, as we have unfortunately seen here with other recent developments further to the west up Flanigan Lane.